Somerset bowled out Essex for 159 before the Division One leaders fought back impressively with the ball as 15 wickets fell on day one at Chelmsford. Essex lost wickets in clusters, slumping to 39-4 and 98-7 with opener Nick Browne (44) top scoring. Pacemen Craig Overton and Paul van Meekeren took four wickets each. Somerset were in trouble at 20-3, before James Hildreth (50) and captain Tom Abell (30) rebuilt, but both fell late on to leave the visitors 118-5. Hildreth and Abell looked set to put Somerset in a strong position at stumps until seamer Jamie Porter removed the pair in successive overs to finish the day with 4-27. 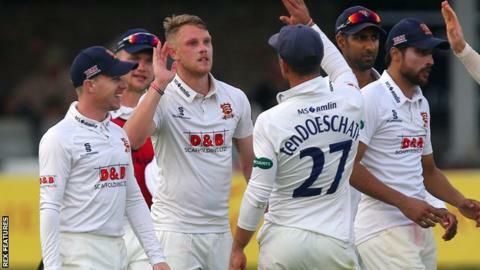 Heading into the match, unbeaten Essex held a 41-point lead at the top of the table with five matches remaining, while Somerset were 20 points from safety in eighth. But it was the visitors who looked like the form side after Essex had chosen to bat first, with Netherlands international Van Meekeren and 23-year-old Overton running through the top order before lunch. Browne and skipper Ryan ten Doeschate briefly threatened a recovery with a fifth-wicket stand of 51, but Ten Doeschate edging Overton to slip triggered another three wickets to fall quickly. Essex then stumbled to their second-lowest total of the season, with only Mohammad Amir's entertaining unbeaten 22 taking them past 150. Porter was equally as destructive with the ball in the evening sunshine, to leave the game in the balance. "I feel we are back into it now. If we put a big shift in in the morning, the first hour, win that first hour, then it is going to go a long way to putting us in a good position. "If we can bowl them out for somewhere near where we finished up then we are massively in this game. It's weird - I don't think any of us really felt panicked. "I know it is a below-par score, but we are a good enough side that, if we do fall behind, we can easily get back into it. But Hildreth and Abell showed you can score runs out there." "I feel we're on top. We'd like to have lost a few less wickets, but I feel we're in a good position. Both teams wanted to bat this morning so to bowl them out for 159 on a hot day was pretty good. "We're not used to this heat in England, but we all stuck to our guns and to get them out for 159 we're really happy. We'd be happy with any lead, but ideally we probably want 50-60 at least. "Paul van Meekeren bowled really well. Some balls skid through really quickly, but sometimes it comes out slightly differently and it's tough to face. We bowled really well together."